Plantain 1st Aid Salve 2 oz. Plantain is the traditional plant for healing wounds. The leaf can be used for topical relief of all sorts of injuries such as cuts, scrapes, bites (including chigger) and stings. It’s strong enough to work on some of the worst bites, but mild enough to use every day and wonderful for babies’ diaper rash or cradle cap. Common bites like chigger, mosquito and tick bites respond well to this oil-based salve. It may take a few seconds up to a minute or two for the salve to numb a mosquito or tick bite, but then it usually doesn’t bother you anymore. This salve will also help on some stings as well as most scrapes, torn cuticles, and dry skin. This first aid salve is handmade with love in small batches using sunflower seed oil, Vitamin E, beeswax from a neighboring organic farm, and plantain that has been raised organically. $1 sample sizes are also available - just email me at missouriherbs [!at] gmail.com! 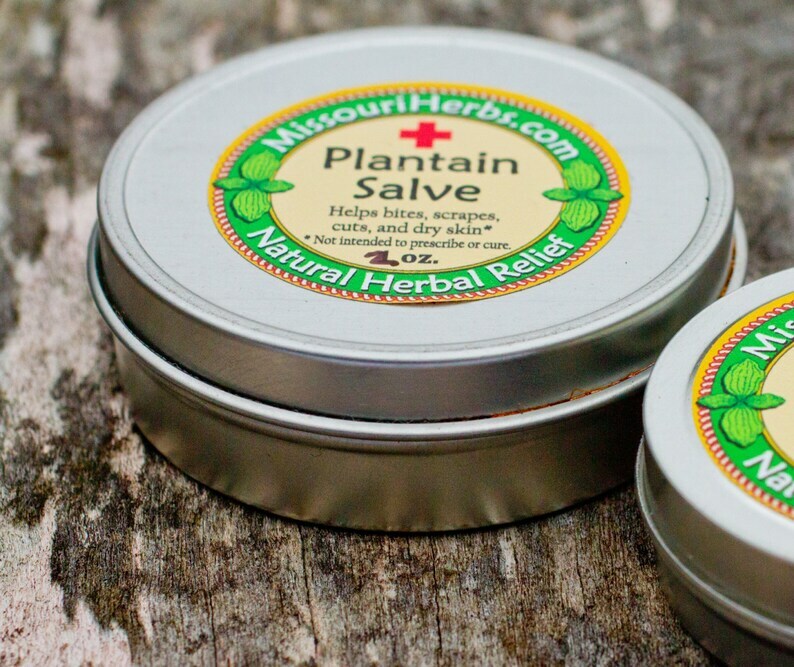 "I just love the Plantain Salve! I carry a purse size "sampler" with me all the time in my purse and my big jar stays on my desk. This is truly one of the best and versatile products I have ever come across. I work with my hands, knitting, crocheting, cleaning services, housework, garden and yard work. It all takes its toll. I use if for dry skin, torn cuticles, any kind of cut, scrape or scratch. It helps it heal so fast. It is also wonderful to take the itch out of chigger, mosquito and flea bites. I only have to apply it once to a bite and then I literally forget that it is there. This salve is nicknamed the "Green Band-aid" and that is a very apt description." Thanks for checking out our shop, please send us a message if you have any questions or requests! To get more info on the work we do, where you can find us in the real world, and events we have coming up, head over to our website, www.missouriherbs.com, or my facebook page: https://www.facebook.com/jamie.jackson.9237?fref=ts. Plantain 1st Aid Salve 1 oz. Plantain 1st Aid Salve 4 oz. Comfrey / Cottonwood Arthritis & Sore Muscle Salve 2 oz. Dry Itchy Skin Salve 1 oz. 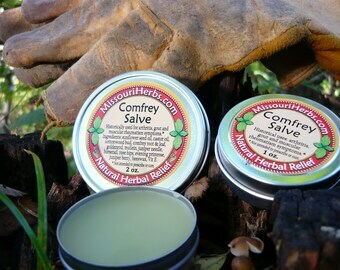 Comfrey / Cottonwood Arthritis & Sore Muscle Salve 1 oz. My dad was here to visit from Germany, he tried this salve and it helped his skin condition so much that I'll be sending this to Germany for him from here on out. I’m using this for cystic acne. So far the painful one I had on myforehead is starting to shrink after 2 days and is much less painful. Timely arrival and exactly as described. thanks. Lavender Face Butter 1 oz. Rose Face Butter 1 oz. 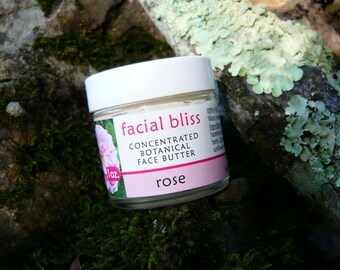 Hint of Scent Jasmine Face Bliss (skin butter) 1 oz. Poke Root Castor Salve 2 oz.